He’s in no doubt that they owe their success, in part, to the Community Business Development Corporation (CBDC). Mohrez had realized soon after immigrating it would be difficult to land a job quickly in his area of expertise, given accreditation and language issues. So he ended up working in a pizza restaurant in Halifax for the first couple of years, developing both his language and business skills. 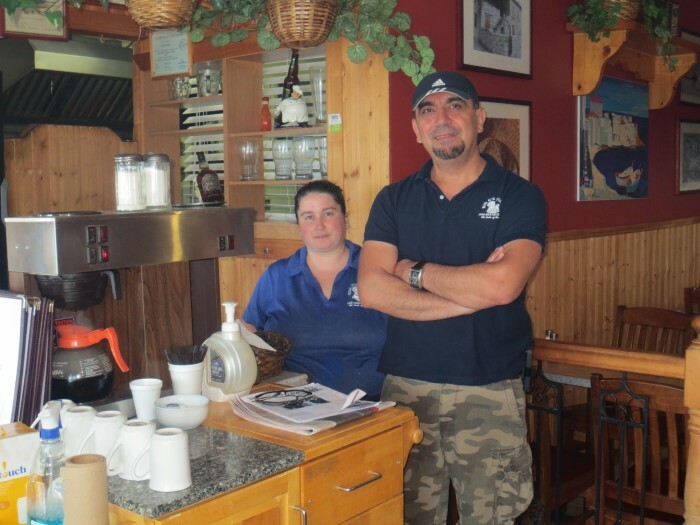 When a family member offered him a job at the former Guysborough Pizza, which he owned, Mohrez and Khalil moved to the town in 2002 and he began employment there. When the owner offered to sell him the restaurant business and property, he welcomed the chance. “I took it over, and the opportunity to be a business owner, and we started from there,” he recalls. They changed the name to Big G’s and expanded the menu to include a variety of seafood and Mediterranean disches, which proved popular with customers. Five years ago, they decided that if they were to be really successful, however, they would need to renovate. As with many rural businesses, the bulk of Big G’s income is earned in the summer months. In particular, the couple was keen to improve the exterior of the restaurant, which is on Main Street, to make it more appealing to tourists and other passers-by. However, although he held a mortgage on the property, the banks were not keen to extend a further loan. Mohrez found out about the Guysborough branch of CBDC through their customers. CBDC Guysborough took over their small mortgage on the property, and provided an additional loan. While Mohrez is reluctant to discuss specific amounts, he says it was sufficient to allow them to make exterior and interior renovations, repair damages and make some equipment purchases. Last year, CBDC provided a loan for Khalil to purchase the property next door to the restaurant. The original intention was to extend the restaurant premises to allow her to develop another revenue stream – retail and wholesale Mediterranean desserts and sauces under the Big G’s brand name, incorporating prized family recipes. But after renovating the property, the couple decided she should take advantage of an opportunity to rent the space to Canada Post, whom they deemed would be a reliable, long-term customer. So now they are looking to renovate their dining space and kitchen within Big G’s itself to accommodate the dessert and sauce business. “I would like to see it on the shelves in all of the grocery stores in Nova Scotia,” says Mohrez. However, they will take that “step by step,” he adds. Big G’s employs three people full time, year-round, not including Mohrez, and six during the busy summer season. The restaurant owner notes that they were “honoured” to be a past winner of the Seven Wonders of Guysborough County. “For us, Guysborough County is our home. Especially with the two kids who were born in Guysborough. And at CBDC, probably they can see that. Banks cannot. That's why we believe in them, and hopefully they believe in us. They gave us the energy to stay for many, and many more years,” says Mohrez.